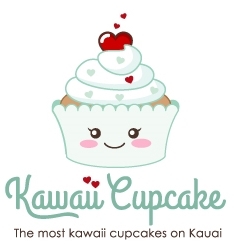 Kawaii Cupcake is a catering company on Kauai, baking fresh, handcrafted goodies and delivering them right to your event! Creating custom desserts that add creativity and style to any event is our specialty. We design for weddings, birthday parties, baby showers, holidays, graduations or any other occasion when you want to make people smile! We also believe in voting with your dollar and have chosen to only use organic eggs, butter and milk. We use other cage-free, cruelty-free, organic and local ingredients as much as possible. Sale pricing is for preordered goodies for pick up on February 14th in Kilauea. Orders must be confirmed and paid in full by February 12th, 2019.